Save your shoes, rescue your boots. Durable, flexible, and shock-absorbing, Freesole® Urethane Formula Shoe Repair is made from the same material as most shoe soles, so it can quickly reattach soles, rebuild worn heel and toe areas, and create tough toe caps. Use Freesole to reattach and rebuild the soles of your boots and shoes. Freesole is part of a comprehensive line of Care and Repair products from Gear Aid. With Gear Aid, anyone can be a master of gear repair. Works on all types of footwear, including boots, athletic shoes, climbing shoes, rollerblades, and more. Freesole® Urethane Formula Shoe Repair is a patented urethane rubber repair system designed to restore and rebuild all types of footwear. Unaffected by heat or solvents, Freesole cures to a flexible thermoset rubber product providing superior adhesion, wear resistance, flexibility and waterproofing. 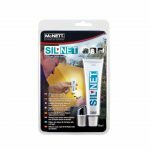 The highly concentrated formula has minimal shrinkage: thick repairs can be made with only one permanent application. Ideal for worn heels, toes, sole and ski delaminations and more. Freesole will not separate with repeated flexing. PREP: Roughen damaged area with sandpaper or wire brush. Use cloth to clean area with Cotol-240™plus Cure Accelerator/Pre-Cleaner, paint thinner or lighter fluid. Repeat cleaning for best adhesion. TAPE: For thick repairs at edge of sole or heel, place removable tape (cellophane or masking) around edge to form a dam. Double thickness of tape works best. APPLY: Squeeze FREESOLE Urethane Formula Shoe Repair onto area to be repaired, level with a stick, toothpick or knife. Keep repair facing up and level until FREESOLE becomes solid. Remove tape. DRY: Allow thin repairs to cure overnight; thick repairs 24-48 hours. Longer times may be needed in dry climates or times of low humidity such as cold winter days. FOR 2-4 HOUR DRY TIME: Mix in Cotol-240™plus Cure Accelerator/Pre-Cleaner. 1. Dull area by roughening with sandpaper, or by cleaning with FREESOLE Pre-Cleaner, acetone or nail polish remover. 2. Mask off area to be coated, including sole edge if coating is to be extended to it. Keep area level and upright during application and curing, as for example, by cradling shoe in crumpled newspaper or box. 4. Remove tape after FREESOLE dries to a soft solid. Allow to cure overnight. REPAIRING SOLE SEPARATIONS * Roughen smooth surfaces. Clean surfaces to be joined as noted above. Apply FREESOLE to both surfaces. Allow to dry 15 minutes. 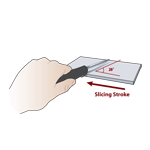 Join and hold (clamp or tape) surfaces together overnight. WATERPROOFING SEAMS, STITCHING & WELTS * Clean area as noted above. 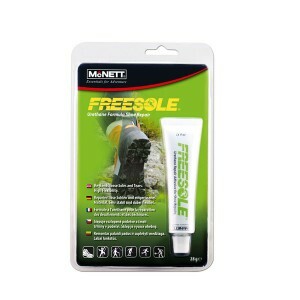 Apply FREESOLE along seam or between sole and upper directly from tube or with toothpick. TO SPEED UP DRY TIME, use cure accelerator. If cure accelerator is not used, apply FREESOLE then place object into a high-humidity environment. For example, an open box covered with a damp cloth. CLEAN-UP: To remove FREESOLE from hands, use cloth soaked in paint thinner, nail polish remover or isopropyl alcohol. When cured (dry) Freesole is a tough, urethane rubber that won’t crack. Freesole re-bonds to peeling soles and rands (the strip of rubber that circles the shoe above the sole). 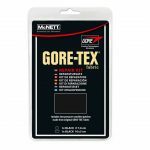 It dries to a solid rubber in as little as 2-4 hours if mixed in Cotol-240™plus. When applied, Freesole cures by reacting with humidity in the air. It doesn’t ‘dry’ the way other glues do. It changes from a moderately thick liquid to a thin, flexible, elastic rubber. Keep partially used tube in freezer. 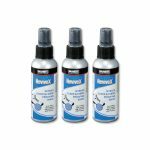 To remove strong odours from boots and shoes, spray with ReviveX® Footwear Odour Control. Thoroughly spray all surfaces – inside and out, including the tongue where odour causing bacteria likes to hide.